I've been preparing Thanksgiving and holiday meals for 38+ years now, and I've learned a lot through trial and error. My #1 tip is to do an inventory at least a few days before the meal and make sure you have all of the cooking equipment and serving dishes you will need to pull off a successful meal. First you need to figure out your menu and assemble the recipes you'll need. 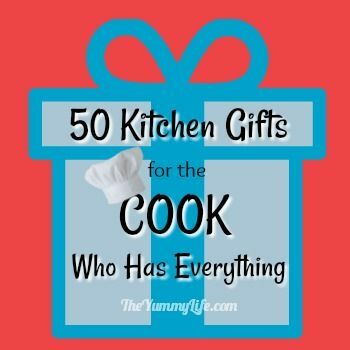 Then go through each recipe and make sure you have all of the kitchen gear you need to make each one. Think about the table, too. What dishes and serving pieces will you need? When you do this planning in advance, it will give you time to borrow or buy whatever you'll need. Goodbye last-minute scramble! Below is the list of the kitchen gear that I use for making a traditional turkey meal for Thanksgiving and other holiday meals. (At my house, we have an identical turkey menu for both Thanksgiving and Christmas.) 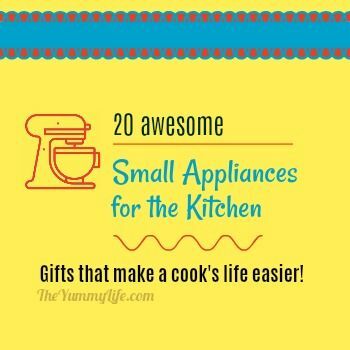 You may already have things on hand that will substitute for some of these. 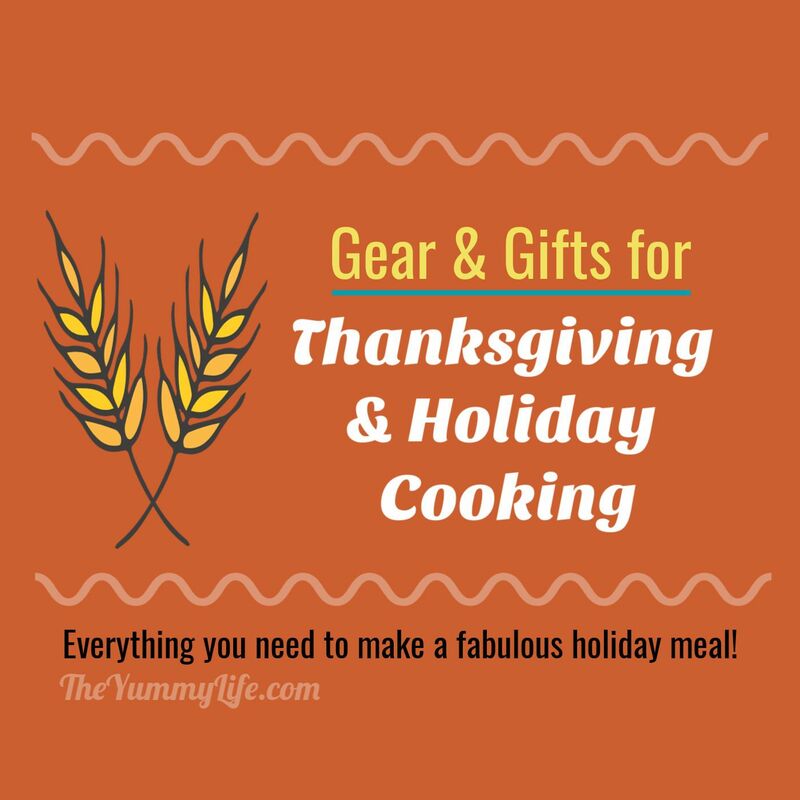 Make your lists early and assemble your gear to avoid stress and panic at the last minute when you don't have something essential for preparing that turkey dinner. All of these items make great gifts, too! 1. Oven Thermometer (view on Amazon). If you consistently have over- or under-cooked food, chances are that your oven temperature isn't accurate. Find out with this inexpensive thermometer. Calibrating your oven temperature is essential to successful baking and roasting. That's particularly important when it comes to roasting a turkey. If your oven temperature is off, it will be a guessing game as to the where you should set your oven temperature and how long it will take your turkey to cook. 2. High heat, water-proof gloves (view on Amazon). I originally bought these awesome gloves for use when I grill, but I find myself frequently reaching for them in place of my old cloth oven mitts. They make it so easy to handle a big, heavy turkey. I flip my turkey over during the roasting process. I used to do that using folded paper towels, but I had to work quickly before the grease and heat soaked through and burned my hands. These gloves make it so easy. The gloves are washable in sudsy water or in the dishwasher. 5. Pull-apart Roasting Rack (view on Amazon). Set this inside the roasting pan (#6 below) to elevate the turkey and hold it in place.This makes it so much easier to transfer a heavy turkey to a platter or cutting board. A center rod pulls out and the two sides of the rack can be easily removed to leave the turkey exactly where you want it. 6. Roasting Pan (view on Amazon). An Amazon best seller, this is a sturdy, stainless steel pan made by Cuisinart. It comes with a roasting rack, too. 7. Silicone Pastry Brush (view on Amazon). I use this for brushing the turkey with olive oil (or melted butter) and prefer it over one with natural bristles. It's heat tolerant and is dishwasher safe. 8. Cooking Twine (view on Amazon). This has many handy uses in the kitchen. I use it to tie the turkey legs together. 9. Turkey Lacing Skewers (view on Amazon). Use these to hold the turkey skin in place so it covers the opening in the cavity. 10. Platter for Serving Turkey (view on Amazon). This white porcelain baking dish has a 4 qt. capacity and is big enough for serving your turkey. The tall rim contains juices. 11. Serving Tongs (view on Amazon). These multi purpose kitchen tongs have an ergonomic handle that makes it easy to pick up food for cooking, grilling, and serving. They are dishwasher safe and great for serving turkey slices. 12. Grease Separator (view on Amazon). I've used several models, and this easy-release one is my favorite for removing every bit of fat from turkey drippings and broth. 13. Wire Mesh Strainer (view on Amazon). I pour cooked turkey stock through this strainer into the grease separator to remove all of the bits and pieces. It can also be used to strain out any accidental lumps in your finished gravy. 14. Wire Whisk (view on Amazon). This is an essential tool in my kitchen and is especially helpful for making lump-free gravy. 15. Gravy Boat with Stand and Candle Warmer (view on Amazon). This keeps 2 cups of gravy, sauces, or syrup warm. The white porcelain looks lovely on the table. Dishwasher safe. 16. Teapot for Gravy Server (view on Amazon). I use my teapot for a Gravy Server. It works great. Remove the tea infuser, fill with hot gravy, and keep the gravy hot by resting it on a candle/teapot warmer (see below). 17. Teapot/Gravy Warmer (view on Amazon). When I need to keep the gravy warm for awhile, I put it on this candle warmer on the table or buffet. 18. Wide-Mouth Pint Jars (view on Amazon). I use these jars for shaking the flour slurry for the gravy. I also pour the finished gravy into these jars to store in the fridge or freezer. 19. Organic Chicken Broth (view on Amazon). Chicken or turkey broth is an essential ingredient in gravy. If you don't have homemade broth, this Swanson's Organic 100% Natural Chicken Broth is very good and was rated #1 by Cooks Illustrated for the best taste. 20. Immersion Blender (view on Amazon). Got lumps? Run this through your pan of gravy and the lumps will instantly disappear. It's a handy gadget for blending sauces, soups, shakes and smoothies, too. I use mine regularly for making small batches of whipped cream in a flash. This model is the #1 recommendation of Cooks Illustrated. 21. Programmable Crock Pot (view on Amazon). I love my slow cooker! This model is a top recommendation of Cooks Illustrated's test kitchen. It heats evenly and automatically switches to a warm setting when the food is done. 22. Potato Ricer (view on Amazon). This gadget is an easy way to get smooth, light mashed potatoes. It comes with disks for medium or coarse and is dishwasher safe. #1 pick of Cooks Illustrated. 23. Potato Masher (view on Amazon). This is also easy to use and less expensive tht the potato ricer (#22 above). Works especially well for "chunky" mashed potatoes. I also use this for making guacamole and mashing fruit for jam. 25. White Porcelain 9x13 Baking Dish (view on Amazon). You can bake and serve from this dish--it looks lovely on the table. The lack of handles means it fits in my toaster oven, too. I have two of these, because they're so versatile. I bake and serve green bean casserole and dinner rolls in these, so they can go directly from oven to table. 26. 12-cup Bundt Pan (view on Amazon). Food bakes evenly and releases easily from this pan. It's the #1 recommendation of Cooks Illustrated's test kitchen. Use it for cakes, frozen desserts, and gelatin, as well as this stuffing recipe. I bake my rolls in a porcelain 9x13 baking dish -- see #25 above. 27. Kitchen Aid Artisan Stand Mixer (view on Amazon). This 5-qt. mixer gets so much use in my kitchen. It comes with a glass bowl with handy measurements. I added a stainless steel bowl; it's nice to have both. Mix and knead the dinner roll dough with ease with this mixer. 28. Multi-purpose Scraper and Chopper (view on Amazon). This is a handy tool for cutting the dough into roll-size portions. 29. Pyrex 9" Pie Plate (view on Amazon). I have two of these that I've been using for years. They're rated #1 by Cooks Illustrated. Here's what they said: "Good crisping and browning, a see-through bottom to monitor the bottom crust, a half-inch rim, shallow, angled sides, and a low price made this our winner—again." 30. 9" Pie Crust Shield (view on Amazon). No more burnt pie crust edges! I love this inexpensive gadget. Now all of my pie crusts get eaten instead of left on the plate. 31. Adjustable Rolling Pin (view on Amazon). I am totally sold on this after having used a traditional rolling pin for many years. You can adjust the guides on the end to get perfect, evenly rolled dough and pie crust in exactly the thickness you want. 32. Silicone Pastry Mat (view on Amazon). This extra large pastry mat sticks to the counter top, but the pie dough doesn't stick to the mat. This makes rolling out the dough so much easier. It's great for cookies, too. 33. Pie Crust Maker Bag (view on Amazon). If you've ever struggled with rolling out an even, round pie crust and transferring it to the pie plate, this totally solves those problems. It works with amazing ease. A must-have for any pie maker or wannabee pie maker. 34. Serving Utensils (view on Amazon). This 5-piece multi-purpose utensil set has a classic style and is dishwasher safe. 35. White Porcelain Serving Bowls Available in 3 sizes (view on Amazon 10 oz., 18 oz, and 28 oz). 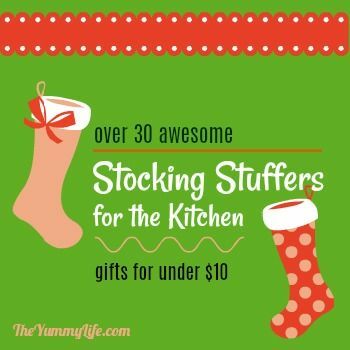 Great for serving cranberry sauce, veggies, dips....whatever! 36. Butter Keeper (view on Amazon). This porcelain butter keeper safely keeps butter soft on your kitchen counter. It is a great way to serve soft butter on the table, too. 38. Square Plastic Containers (view on Amazon). This 60 piece food storage set is great for storing leftovers. The square shapes make for efficient stacking and storage. 39. Glass Storage Containers (view on Amazon). This 9 piece storage set is leak-proof and safe for freezer, microwave, and dishwasher. 40. Deli Containers (view on Amazon). Send leftovers home with your dinner guests in these handy deli containers. 41. Dissolvable Labels (view on Amazon). These write-on labels are a quick and easy way to label your food containers. The labels easily wash off of emptied containers. I hope this list of my favorite gear has been helpful to you. If you have any questions or additional suggestions, please leave them in the comments section below.